Golden brown and savory, baked stuffed mushrooms are an easy recipe and so delicious! These are creamy and spicy mushroom filled with mouthwatering flavor! 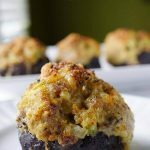 Stuffed mushrooms can be used as an appetizer or main course! Chop the mushroom stems, dice the onions and celery. In a small saute pan over medium heat add the olive oil. When hot add the mushrooms, onions, celery. Season with salt, pepper and red pepper flakes. Sauté for about 4 minutes until the vegetables just start to soften. Add the garlic & saute until it becomes fragrant about 30 seconds, remove from heat. Allow to cool. Combine pork, bread crumbs and cheeses. Add the sauteed vegetables, bread crumbs and egg. Mix by hand until just combined. Stuff mushrooms and set in an oven proof dish. Top each mushroom with a good pinch of the Parmesan cheese. Bake in the oven uncovered for 30 minutes. Remove from the oven. Set temperature to broil and insert under the broiler. Broil until the tops turns golden brown - about 4-5 minutes depending upon your oven. Serve & enjoy!